Dear Reader, I must confess that when a plant makes an appearance in my garden, I am inclined to leave it alone until I find out what on earth it is. Sometimes, this is a grave error (the incident of the Ground Elder springs to mind). On other occasions, though, I discover that exactly the right plant has appeared for the spot that it has chosen, and then I am delighted. The plant above is called Pendulous Sedge, and it has erupted like a green fountain in a particularly shady spot next to my pond, where everything else I’ve tried to grow has failed. The name ‘Sedge’ is said to come from the same root as the Latin verb ‘secare’, meaning to cut, and the sedge family has been used for everything from papyrus to basket-making to boat-building. However, what I like about Pendulous Sedge is its grace and vigour.Four or five catkins dangle gracefully from each stem, like so many lambs tails – there are usually one or two male catkins at the top, with the female ones underneath. Pendulous Sedge likes cold, claggy clay soil, and so it has succeeded where so many of my fancier plants have folded up and died. I note that opinions on the plant are divided. On the RHS website, it lists no fewer than 132 suppliers who will sell you a Carex pendula should you not have one simply turn up. On checking one nursery, I discover that three plants will cost you 9.99 GBP plus postage. I feel a momentary warm glow of satisfaction. However, further on on the same website I notice that it is described as a ‘thug plant’ – one that can quickly get out of hand and run rampant all over the garden. Harrumph. I suppose the question is this: do we want a garden in which the plants that grow thrive, or do we want to be forever coaxing, forcing and persuading plants to do well when they’d much rather be elsewhere? 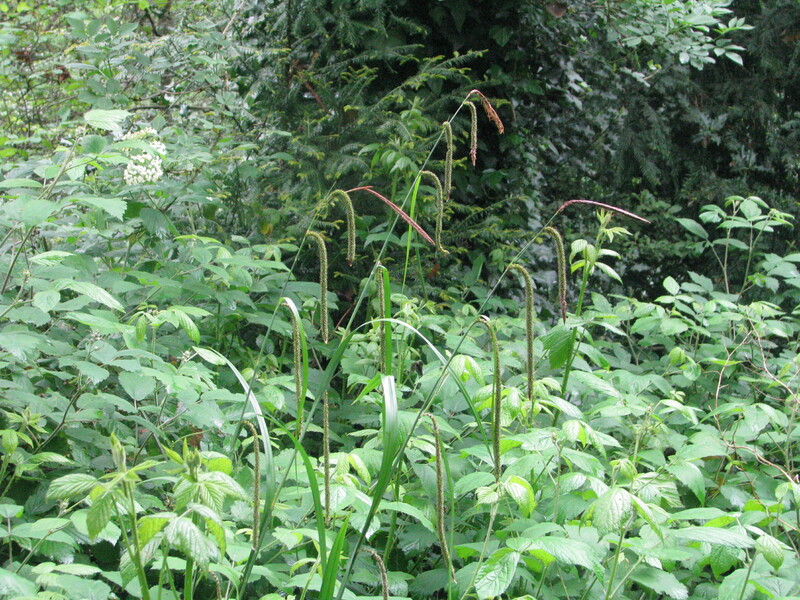 Pendulous Sedge is a plant not only of watersides, but of ancient woodlands. The photo below is from my visit to Cherry Tree Wood last week, where I saw the plant growing happily in a damp hollow. Not so long ago, the land where my house now stands was part of Finchley Common, an area of scrub and moorland that was notorious for Highwaymen right up to the Eighteenth Century. A gibbet used to stand at the end of what is now the road next to mine. I have no doubt that every gully and pond would have had stands of Pendulous Sedge, and when it pops up in my garden now, it reminds me that human settlement is a very recent thing here, and that the plants and animals still reflect the way the land was then. So, thug or not, it is welcome in my garden, for the frogs to sit under, for the dragonflies to rest on, and for all manner of creeping things to nestle into. This entry was posted in London Plants on May 7, 2014 by Bug Woman. 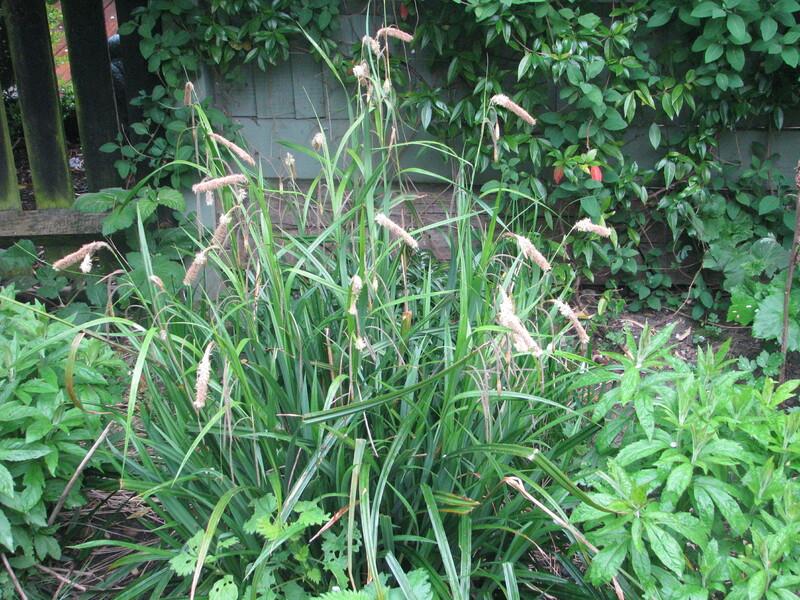 Vivienne, we have some Pendulous Sedge growing in the corner of our garden, but up till now I had no idea what it was. Seems to thrive very well, but appears to like the shaded areas. By the way, thanks for the recommendation of Jerry White’s books a while ago. Just reading “London In The Eighteenth Century”. Really good.